Philosophy - Gary L. Whited, Ph.D.
all at once, one, continuous." As a grad student, translating Parmenides’ poem from the classical Greek opened a floodgate of remembering my life on the prairie. 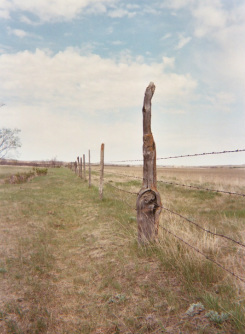 That remembered prairie life became a vehicle for traveling into the language through which Parmenides’ poem evokes a journey into thought on the nature of Being and Becoming. Remembered fenceposts and my standing next to them exploring their weathered sides and imagining what they had seen and heard standing there at one spot all that time became metaphors that pointed toward the stillness I began to glimpse in the well-placed words of Parmenides. I’d sit for a long time next to a phrase of the Greek, waiting to hear it in its own terms, hoping to move nearer to Parmenides’ choice of a word, a verb tense, or a metaphor that evoked a sense of the one and the still and that embodied these in words that do what they say.